On October 3, 1920, the Dayton Triangles made history when they hosted the Columbus Panhandles at Triangle Park in Dayton, Ohio. Dayton: Famous for Flight... and Football! Triangle Park was home to the Dayton Triangles, one of the original teams of the American Professional Football Association (APFA) which was to later to become the National Football League (NFL). In the first game of the APFA at Triangle Park, on October 3, 1920, the Dayton Triangles defeated the Columbus (Ohio) Panhandles 14-0. Dayton finished the 1920 season going 5-2-2 while Columbus went 2-6-2. The APFA changed its name to the National Football League (NFL) June 24, 1922. 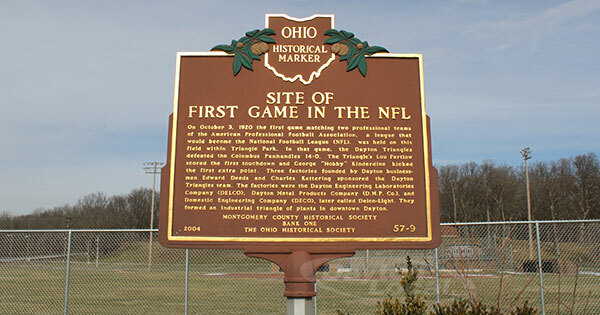 The Ohio Historical Society held a ceremony on Saturday, April 30, 2005 at Triangle Park for the unveiling of the Historical Marker in the photo above, commemorating the historic first game of the NFL in Dayton, Ohio. "On October 3, 1920 the first game matching two professional teams of the American Professional Football Association, a league that would become the National Football League (NFL), was held on this field within Triangle Park. In that game, the Dayton Triangles defeated the Columbus Panhandles 14-0. The Triangle's Lou Partlow scored the first touchdown and George "Hobby" Kinderdine kicked the first extra point. Three factories founded by Dayton business-men Edward Deeds and Charles Kettering sponsored the Dayton Triangles team. The factories were the Dayton Engineering Laboratories Company (DELCO), Dayton Metal Products Company (D.M.P.Co. ), and Domestic Engineering Company (DECO), later call Delco-Light. They formed an industrial triangle of plants in downtown Dayton."